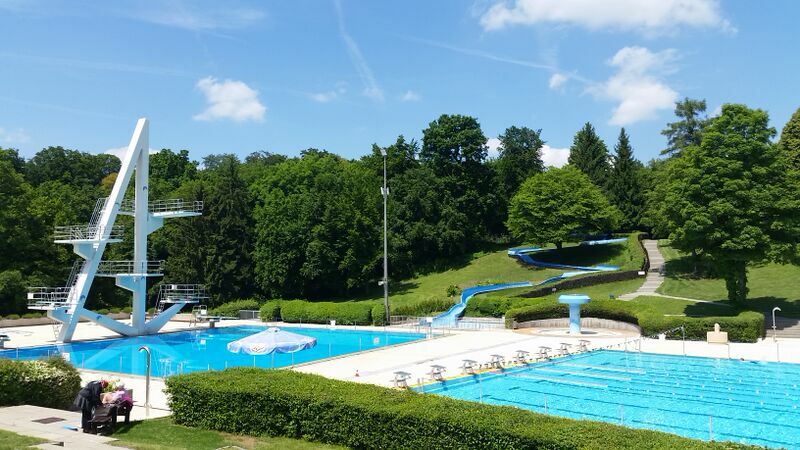 Since PCS season is in full swing, I thought it might be helpful for those of you just arriving in Germany to begin exploring with some simple day trips. 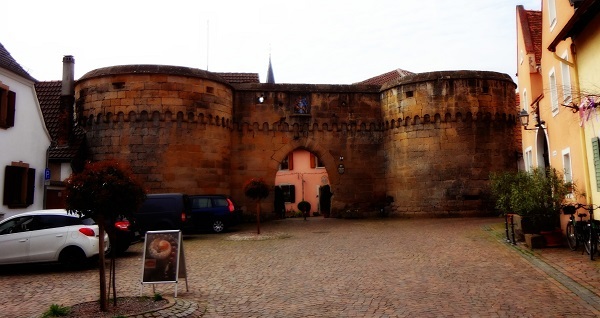 I have put together five easy day trips from Kaiserslautern to get you started. Enjoy! Freinsheim is a smaller town in the Bad Durkheim region of Germany. It’s one of those quaint wine villages that we stumbled on one day on a Harley ride. We like it so much that we started looking for events that would bring us back. We have visited the town a couple of times just to wander through the streets and browse the shops. Recently we were there for their Blütenfest to kick off spring and enjoy some wine. Every year, during the month of January they have a night festival that takes you on a torch-carrying tour throughout the town and local vineyards. Toy Museum: We haven’t been to this (because we no longer have kids at home), but I can see where young kids would enjoy this. Each year on the first weekend in June, the Freinsheim Old Town Festival is held. Its motto is Wein und Kultur auf historischen Plätzen (“Wine and culture on historic squares. As a rule, the festival lasts from Friday to Sunday. The Town Wall Festival held on the third weekend in July in the historic gate is among the region’s largest wine festivals. The Culinary Wine Trail is held on the fourth weekend in September, running through the town’s vineyards. Winemakers and food vendors offer traditional Palatine cooking, Mediterranean dishes, and wine. The Christmas Market is held on the four weekends in Advent and attracts visitors with its Nativity scene, in which living animals are used. Freinsheim is approximately a 1 ½-hour train ride from Kaiserslautern. The train station is very close to the city Centre so this is really the most convenient way to get there, especially for a wine festival. By car, it is approximately 40 minutes east via A6. Unless you are new to the area, you’ve probably been to Trier or at least know about it. Trier is Germany’s oldest city and is a great place to spend the day. They have a downtown area much like Kaiserslautern with plenty of shopping and restaurants. Trier offers a little bit of everything from Roman Baths to craft shopping. Even though it is technically a day trip, you might have to make it more than once since there are so many things to do! 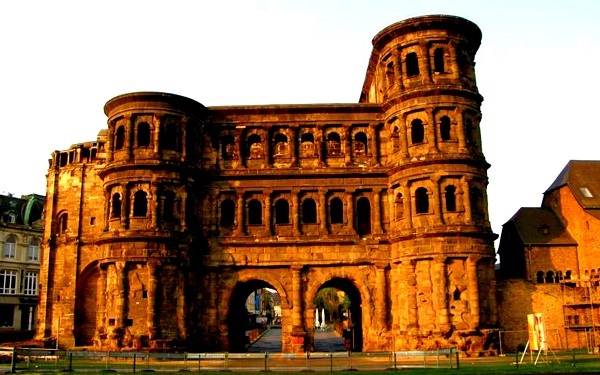 Porta Nigra: The largest Roman city gate north of the Alps. Designated as part of the Roman Monuments and UNESCO World Heritage Site. Imperial Roman Baths: The Kaiserthermen or Imperial Baths is a large Roman bath complex. This is also designated as part of the Roman Monuments and UNESCO World Heritage Site. We have been here a couple of times and it is definitely worth the 3 € to take a self-guided tour. You can read my blog about our visit here. High Cathedral of St. Peter (Cathedral of Trier): This is the oldest Roman Catholic cathedral in the country. Another important historical location designated as part of the Roman Monuments and UNESCO World Heritage Site. Bastel Stube (Craft Store): I went to this store shortly after moving to Germany with my girlfriend. Excellent selection and fair prices. You can read about my experience here. A drive to Trier is about 1 hour and 20 minutes northwest of Kaiserslautern, 1 hours and 50 minutes southwest of Wiesbaden and 3 hours and 10 minutes northwest of Stuttgart. Click on DB Bahn for train information. 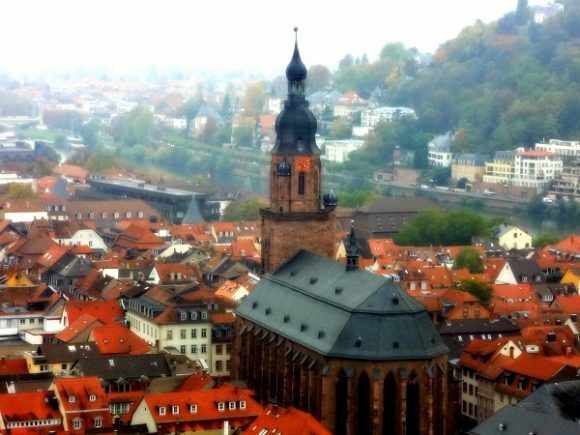 I’m sure everyone has heard of Heidelberg and its castle. Actually, it is the first place I heard about from my parents when we learned we would be moving to Germany. It’s the first city they visited back in the sixties when my dad was stationed here during the Vietnam Era. It was also the very first trip we took after arriving and unpacking. 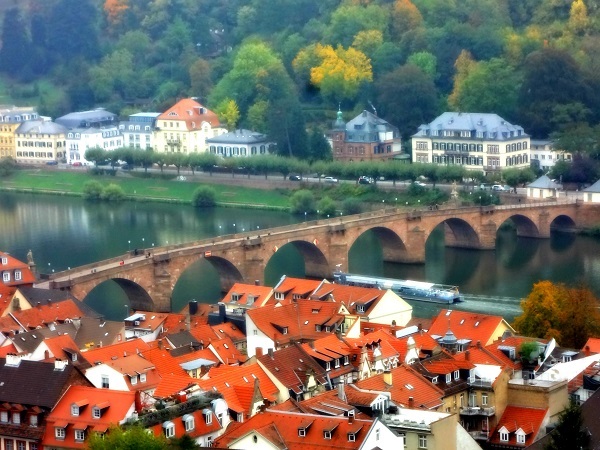 Heidelberg is situated on the Neckar River and is a very popular tourist destination. Schloss Heidelberg: A truly impressive castle overlooking the equally impressive town along the river. We were last there in the fall to visit the castle along with the world’s largest wine barrel and the German Pharmacy Museum. You can read about our trip here. Altstadt (Old Town): I’m sad to say that we still haven’t made it to Old Town, as our trips are usually to entertain someone else and they want to see the castle. My friend, Wendy, wrote a great article about her visit to some sights in Old Town. You can read more about her trip here. Click on BD for train information. Philosophenweg (Philosophers’ Way): This is a path located on the northern banks of the Neckar River. Historically, it was just a path through the vineyards; however, later it was renamed because of the many professors and philosophers who enjoyed the path for its solitude and beauty. Today, the path features gardens and amazing views. Karl Theodor Bridge: Commonly known as the Old Bridge. This is the stone bridge that connects the two sides of the river. You can see this bridge in pretty much any popular picture of the view from the castle. The Heidelberg Castle by car is approximately 1 hour and 5 minutes east of Kaiserslautern, 1 hour and 5 minutes south of Wiesbaden and 1 hours and 30 minutes north of Stuttgart. Click on DB Bahn for train information. 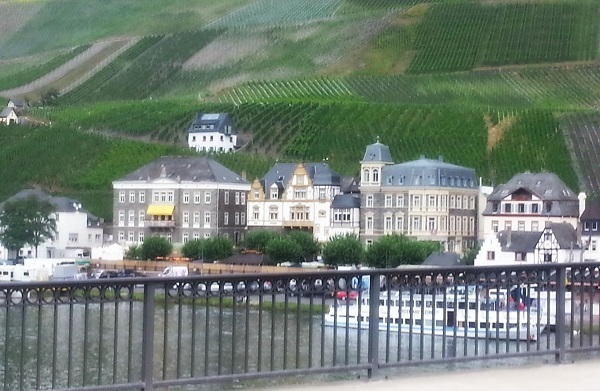 Bernkastel is a well-known winegrowing centre on the Mosel River. The town sits in the valley along the river overlooked by vineyards and a castle. We’ve been there every fall for their Wine Festival that ends with fireworks over the castle. You can read about our experience here. The downtown area is a medieval market place zone strictly for pedestrians, which is great because you can enjoy it without the annoyance of cars. Some of the houses, dating as far back as the 15th century, are a little crooked yet have stood the test of time while others are a bit more spacious. There are plenty of little stores, pubs and cafes as well as historic places. Mosel Wein Museum: This multi-media museum will give you a much better understanding of the region’s winemaking traditions. Guided tours and wine sampling are available daily. Dr. Loosen Winery: Famous for their Reisling! They require a confirmed appointment before you arrive with at least a 7-day notice. I can personally vouch for their customer service. This is a very nice tasting. Burg Landshut: Take a shuttle bus, the Burg Landshut Express, to the castle ruins. The trip up takes about 20 minutes. This castle was largely destroyed by a fire in 1692. It’s a great place to walk around and take in the view below. Bernkastel is an easy one hour or so drive from Ramstein. It’s an hour and 20 minutes northwest of Kaiserslautern, 1 hours and 25 minutes west of Wiesbaden and 3 hours and 10 minutes northwest of Stuttgart. Click on DB Bahn for train details. In my personal opinion, I saved the best for last. I absolutely LOVE Rüdesheim! I’m not sure if it’s the ferry ride that takes you from Bingen, the quaint streets, the vineyards, or the ride over the entire village in a cable car that makes it my favorite. Maybe it’s all of the above. This is a great day trip. So much fun, in fact, that we ended up getting a room and spending the weekend. You can read about our trip here. 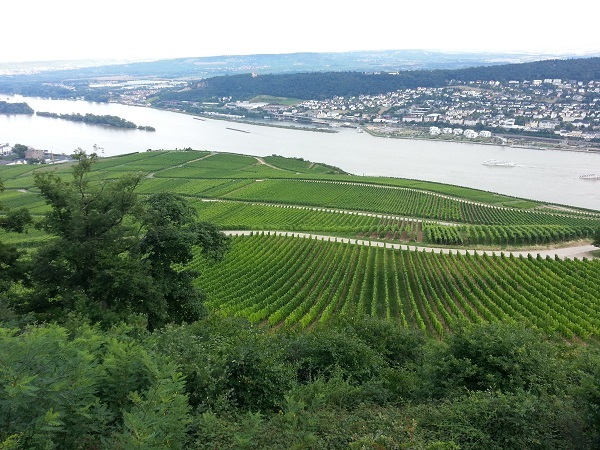 Rüdesheim is a wine-making town in the Rhine Gorge and is part of the UNESCO World Heritage Site. Broemserburg Castle: This is the oldest Castle in the Rhine Gorg. It is now owned by the town and is a wine museum. Siegfried’s Mechanical Musical Museum: This music museum offers a 45 minute tour for 7 € for adults and 4 € for students and children. This is the only option to visit the museum since the tour guides operate the musical instruments for you during the tour. Niederwald Monument: Take the cable cars to see the panoramic views of Rüdesheim and enjoy some time at the monument. Cable cars leave from Oberstrasse. Drosselgasse: Famous street with cafes, bars, music, etc. There are also many wine tours available. When arriving in Rüdesheim am Rhein I recommend picking up a free city guide from the Tourism Office. By car, Rüdesheim is approximately 30 minutes southwest of Wiesbaden, 1 hour and 30 minutes north of Kaiserslautern and 2 hours and 30 minutes north of Stuttgart. Go on DB Bahn for train information. This is by no means an entire list of all of the things to do in these towns. It is simply a recommendation for where to start. Go explore!